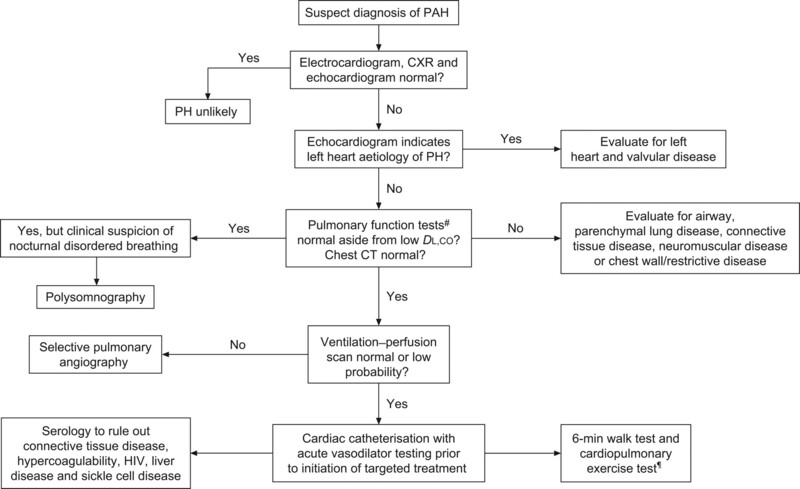 Paediatric pulmonary arterial hypertension (PAH) diagnostic work-up. CXR: chest radiography; PH: pulmonary hypertension; DL,CO: diffusing capacity of the lung for carbon monoxide; CT: computed tomography. #: if unable to obtain a reliable test in a young child and there is a high index of suspicion for underlying lung disease, the patient may require further lung imaging; ¶: children >7 yrs of age can usually perform reliably to assess exercise tolerance and capacity in conjunction with diagnostic work-up. Reproduced and modified from reference 114 with permission from the publisher.